If you haven't read my review of Holsteins, please do. 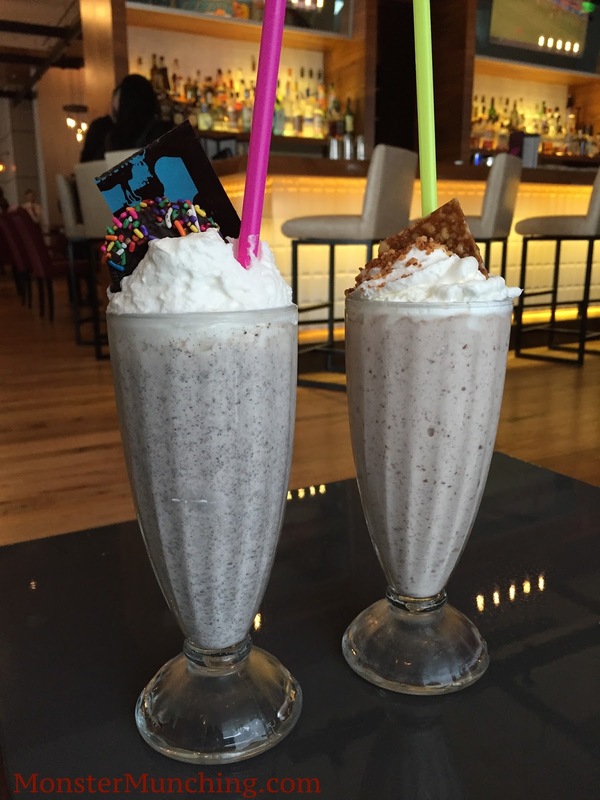 Then go go go, if not for the burgers, then just for a particular "Bam-Boozled" shake they call the Nutella Crunch. And no, do not forgo the booze. You're only saving a couple of bucks if you do and the virgin version is cloying without it. As I said in my review, the alcohol is essential in cutting through the richness of the milk, sugar and cream. 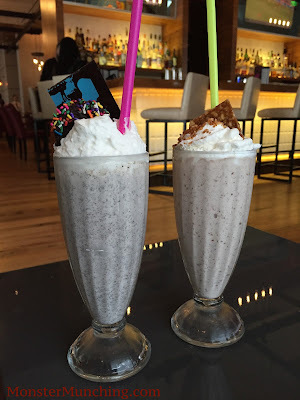 All the flavors are great, but the Nutella Crunch is particularly scrumptious, with bits of caramelized hazelnut pieces suspended in the concoction and the Frangelico smoothing out the dairy. Before I knew it, I sucked up the last remaining dregs of whipped cream from the bottom of my soda-fountain glass and ate the crunchy brittle they put on top. It was then that I realized how dangerous Holsteins' shakes were. It wasn't because of the alcohol (which can hardly be tasted or felt), but because at $13, these are nearly 3 times more expensive than the $5 milkshake referenced in the classic film scene below. No matter what you think about food trucks, you can't not like those that peddle ice cream. Ice cream trucks, after all, predate the recent craze. Whose childhood doesn't have memories of chasing a slow-crawling, sticker-covered van offering prepackaged treats such as fudgesickles, ice cream sandwiches, and half-and-half bars through their neighborhood? They were a staple on my block during the summer and they left chime-y music box renditions of "The Entertainer" and sugar-fueled kids in their wake. These days, they're joined by the gourmet kind of truck, which doesn't so much prowl the suburbs as they Tweet, Instagram, and blog where they'll be next. One of the better ones is Longboards since it not only sells ice cream bars it makes in-house, but lets you customize them whatever way you like. 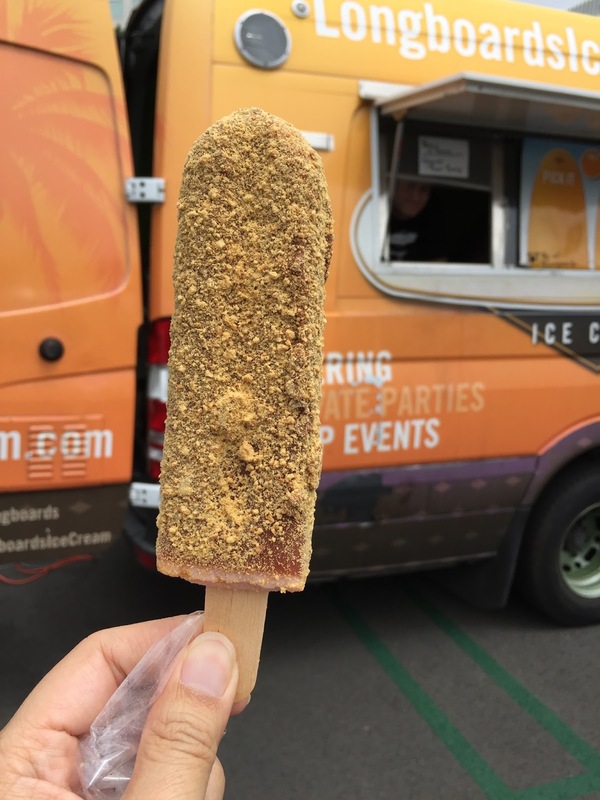 You might say it's the Chipotle of ice cream trucks. You pick your flavor of pre-frozen bar from chocolate to coconut. Then, you choose what melted Ghirardelli chocolate you want it to be dipped in: milk or dark. And finally, you pick a topping from peanuts to Oreo to potato chips in which it will be covered. The best combo I've discovered so far is a strawberry bar, dipped in milk chocolate, rolled in graham crackers. Unlike some of their signature combinations, this one has no official name. But if they asked me, I'd call it "chocolate-covered strawberry shortcake". 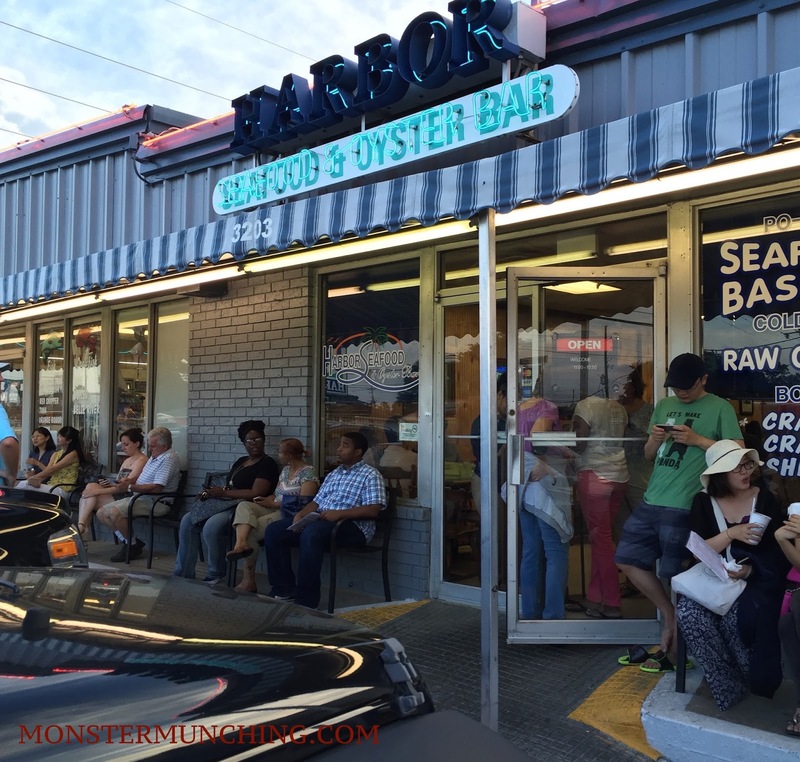 So far, I've talked about Cafe Du Monde and Cochon Butcher, the most iconic and the hippest places we ate in New Orleans; now let me talk about Harbor Seafood & Oyster Bar, the best place we ate in New Orleans. Actually, that's inaccurate. Harbor Seafood isn't in New Orleans. It's in Kenner, which is actually the city you land on when you arrive to Louis Armstrong New Orleans International Airport. That is to say: Kenner is to New Orleans what Inglewood is to L.A. You're still technically in Inglewood when you're in LAX, and you're in Kenner when you land at MSY. This fact makes the place even more elusive to non-locals. It's not listed in any guidebooks. It's never been featured in any travel shows. Bourdain and Zimmern haven't been here. For these reasons, most tourists are clueless about its existence and pass right by it when they beeline it to the French Quarter. We did too, until one of our Uber drivers casually mentioned it out of the blue. "Hey, do you guys like seafood?" he said in a hushed voice as he was making a turn. "Yeah! We love seafood!" we said. And it was then that he told us. "Harbor Seafood," he said. "It's amazing. Crawfish. Oysters. Been there forever. Lines out the door. Gotta get there early. Have you had lunch? Go there now! It's just about to open. It's around the corner from your hotel. Down that way three blocks!" We didn't go right then. We waited until dinner. It was our last meal before we flew out the next morning. And rather than walking, we took a Lyft. And when the Lyft driver asked us where we were headed, she corroborated the Uber driver's story. "Oh, that is a VERY good place. My family and I go there all the time. Get the gumbo. It's been there forever. See, there's already a line. But it's a small place. It'll move quickly. I'll drive you up right to the front. Enjoy your dinner!" And thus began an amazing night. A mind-blowing night. 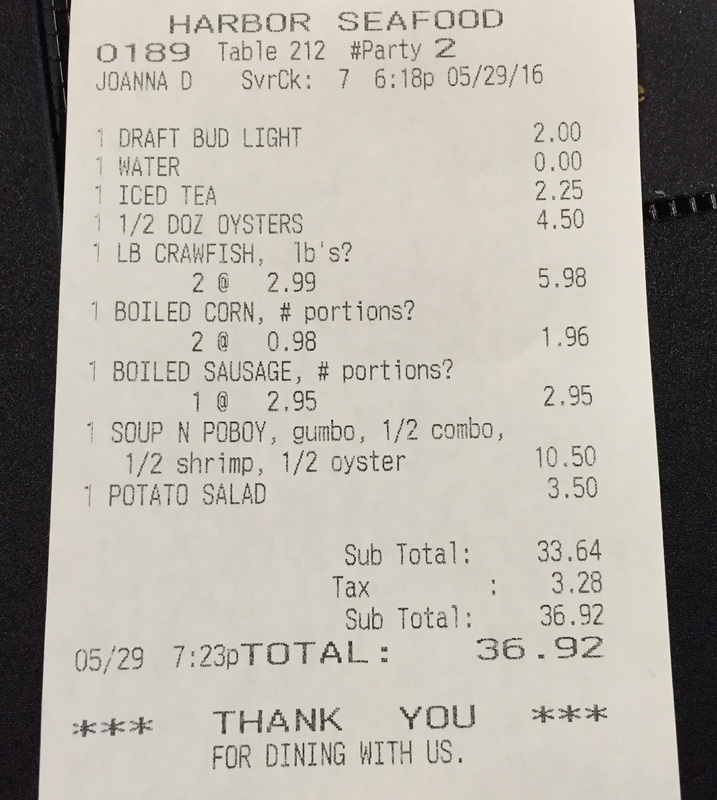 It was the New Orleans feast we'd been waiting for. We ate until we nearly burst. 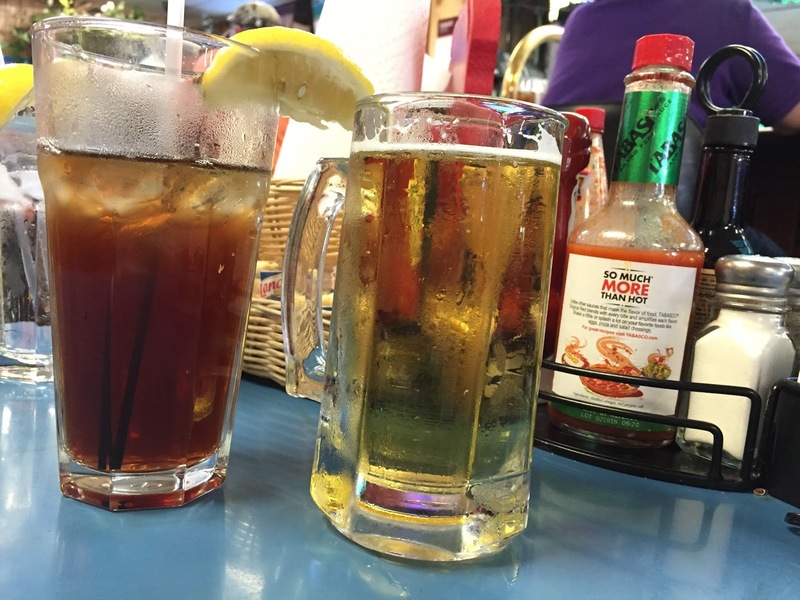 We drank sweet tea and sweaty mugs of cheap $2 beer. 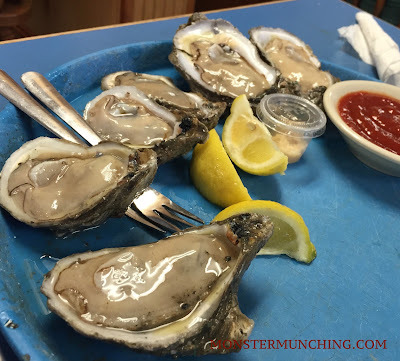 We sucked the spicy juice out of crawfish heads, sunk our teeth into a snappy-spicy Cajun sausage, and gulped creamy, sweet, ultra fresh gulf oysters the size of paddles. 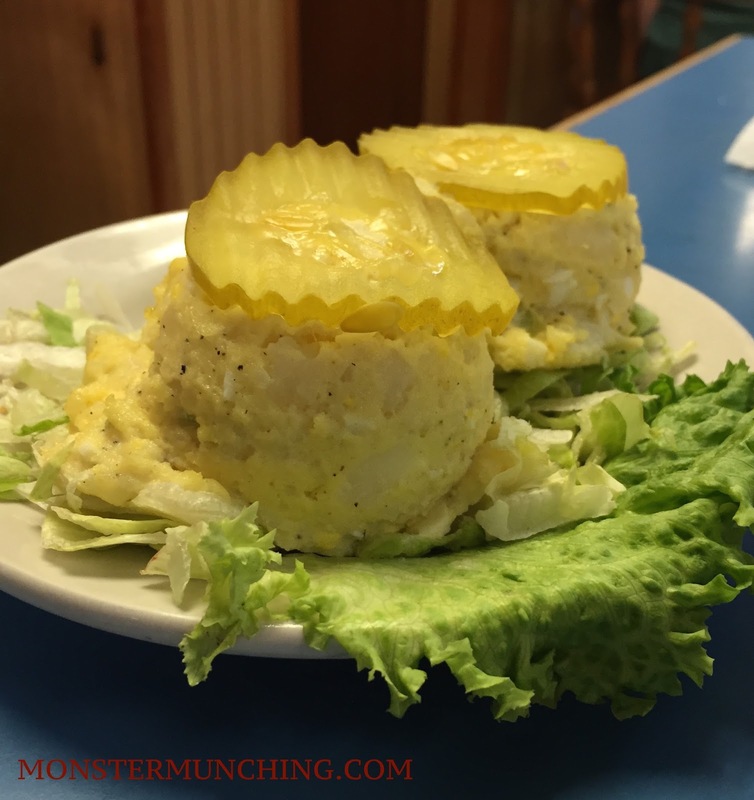 There was an amazing potato salad with bits of egg in it. And the gumbo was like New Orleans history in a cup. 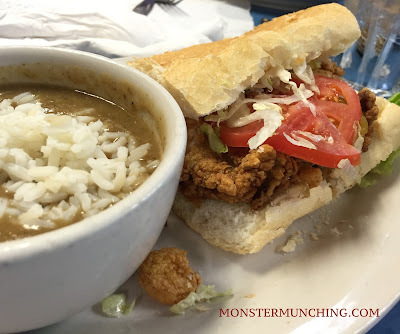 We even devoured a fried-oyster-and-shrimp po boy and gumbo on special even though we were already stuffed by then. 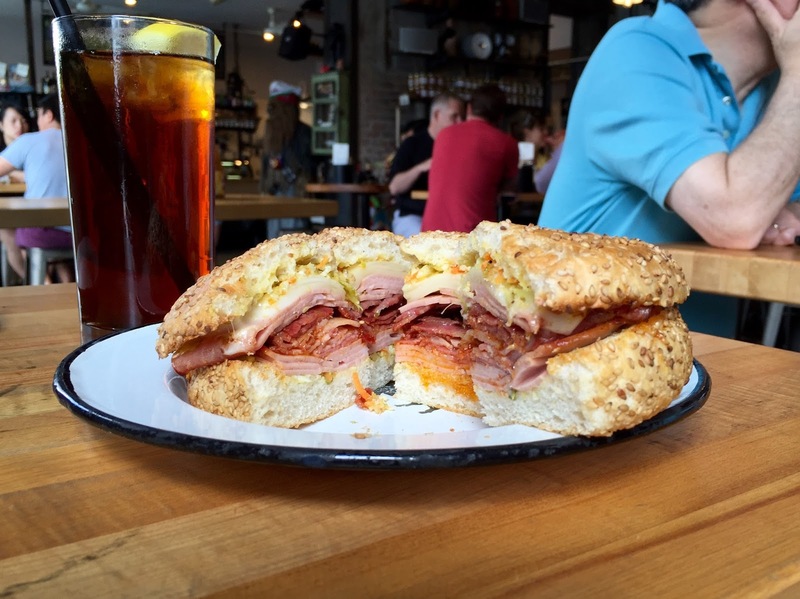 "My God," we said to each other with wide-eyed disbelief as we bit into those sandwiches. "How spectacular is this po boy!?" The bread's so light, airy, fluffy, with just the barest hint of a crackly crust. How is it possible that the fried seafood, and the mustard, mayo, lettuce and tomato--something locals refer to as having your po boy "dressed"--end up tasting so much more than the sum of its parts? 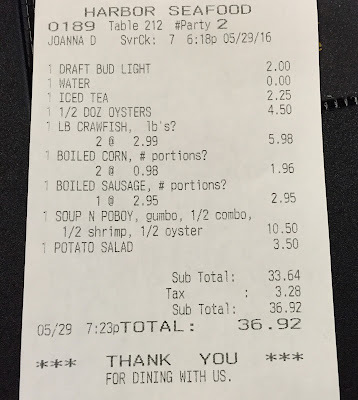 And how is it possible this gigantic plate of food is $10.50, and the crawfish is $2.99 a pound, and the oysters $4.50 for a half dozen? "Did you notice the crawfish isn't drenched in butter like it is at those crawfish joints in California?" "Yes! Yet still it tastes better, spicier, sweeter!" "We should've been eating here all along! Can we move here?" "No, it's too humid. You'd die of heat stroke." "But the next time we visit, we're eating here, like every night, okay?" 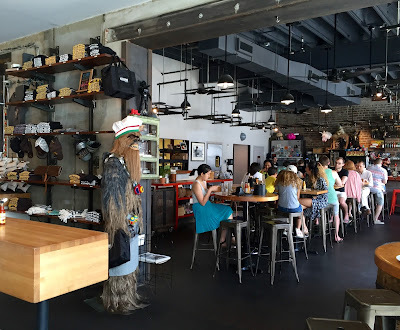 If you read The Lonely Planet guidebook for New Orleans, it will suggest that you add Cochon Butcher to your itinerary. It is not wrong. This deli counter and sandwich shop in the middle of an industrial district is attached to Cochon, one of Donald Link's places. If you don't know who Donald Link is, perhaps you've heard of his restaurants Herbsaint and Peche, both of which won several prestigious awards I won't begin to list here. Or maybe you've seen the guy eating crawfish with Anthony Bourdain in New Orleans on his CNN show. But the real reason I would second Lonely Planet's recommendation to visit Cochon Butcher is the fact that this deli is a bonafide charcuterie. It makes all the meats it sticks into the sandwiches. As the name would suggest, most everything is pig-based. The kitchen even makes a sandwich called Le Pig Mac, which looks exactly like a Big Mac--two patties, special sauce, lettuce, cheese on a sesame seed bun--except made with pork, and supposedly way better. I didn't try the Le Pig Mac, but I mention it because it shows Link's sense of humor. There's also this: he's got a big Star Wars fetish. As soon as you walk in, there's a life-sized Chewbacca wearing sunglasses. A 3D model of The Death Star appears to have crashed into one of the walls. And in the men's restroom, there's Chewbacca again on the wallpaper, watching you pee. 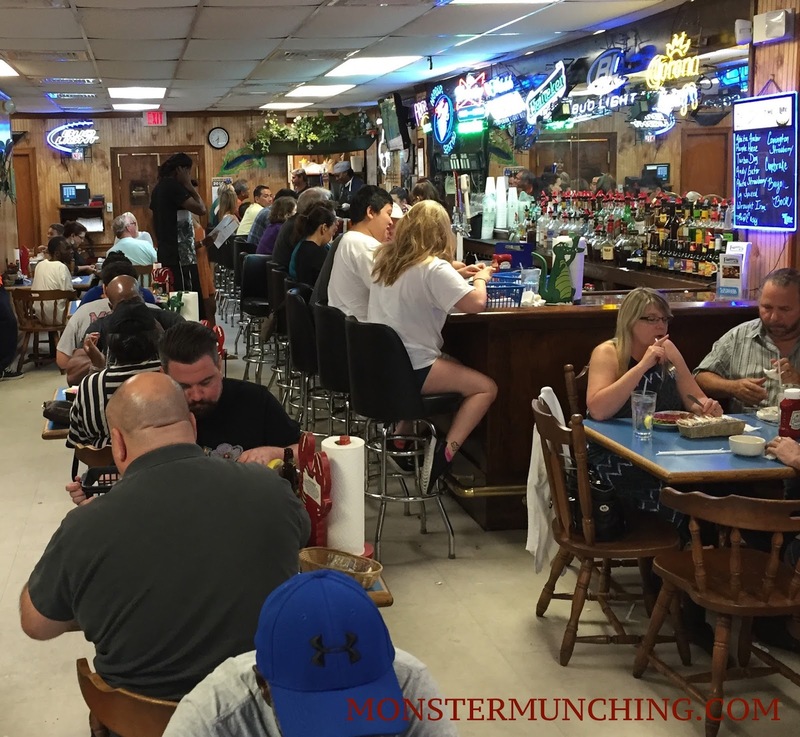 The most popular thing to order here is probably the muffaletta--the quintessential sandwich of this area after the po' boy. And it was a behemoth--packed with layers upon layers of salame, ham, bacon and a few other porcine-based products I could not begin to identify. All of this was tucked between a gigantic dome of a sesame-seeded crusty loaf of a bun that crackled just slightly when I bit into it. And slathered between it and the melted cheese was just enough olive spread to counteract the pork. One order was big enough for the two of us. The kitchen knew it since it's cut into quarters. Apart from being the first muffaleta I've eaten in New Orleans, it was the best pork sandwich I've ever had. And if it could speak, I imagine it would say "May the Pork be with you!" P.S. This post is the second of three that chronicles the best food we had during a recent trip to New Orleans. Stay tuned for a post on the best meal we had in The Big Easy! It can easily be argued that New Orleans has more iconic foods than any region in America. For starters there's muffaletta, po boys, gumbo, red beans and rice, and etouffee, just to name a few. But on top of that list has to be the beignet. 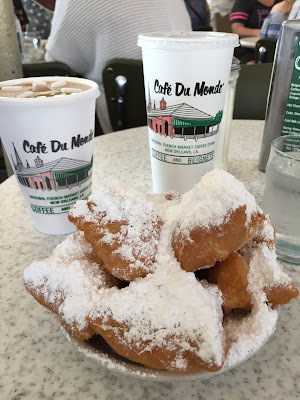 And when you're in New Orleans, not going to Cafe Du Monde to get your beignets is tantamount to refusing to take a picture of yourself in front of the Eiffel Tower. You just have to. Yes, the original Cafe Du Monde in the French Quarter is touristy. It's a mess, actually. The floor is sticky, covered with powdered sugar where there's not puddles of spilled coffee. Trying to find a table is chaotic. There's no attempt at any sort of order. And if you go when it's busy, which is all the time, you're going to have to troll the open-air dining area until something opens up. And when you find a table, you will most likely have to wave down one of the many busboys/waiters to clean up the refuse from the previous occupants. But as soon as you order your own plate of beignets and coffee, you realize you're just as messy as everyone else is. You use up more napkins than you've ever used before. You spill your coffee. And the powdered sugar? You get it everywhere. Cafe Du Monde piles their beignets with so much powdered sugar your fried dough mountain looks like the summit of Everest after a blizzard. And if you lift one up to your mouth, and you breathe on it wrong, the sugar goes airborne. No matter what, some will get on the table, on your hands, all over your face. We read from a guidebook not to wear black at Cafe Du Monde. That was one of the best pieces of travel advice we ever took. But oh how lovely these beignets were. Despite all the trouble and messiness, they were delicate objects. Fluffy and moist on the inside, just crisp on the outside--the whole thing eaten hot out of the fryer. Of course, we took a selfie of ourselves eating it. You just have to. P.S. 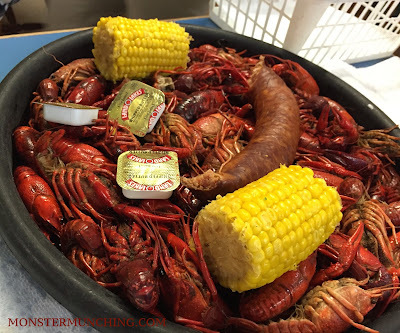 This post is the first of three that chronicles the best food we had during a recent trip to New Orleans. Stay tuned for more!